Alex Woodyard in action for Posh at Blackpool. Photo: Joe Dent/theposh.com. 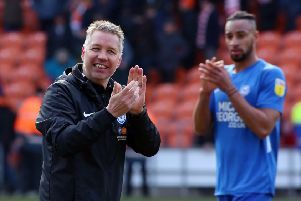 A 1-0 Posh win at Blackpool on Saturday (April 13) maintained the pressure on sixth-placed Doncaster ahead of the crucial Easter programme. Posh are five points behind Doncaster but have a game in hand. Posh have now won three games in a row and kept three successive clean sheets. They take on Fleetwood (away, Good Friday) and Sunderland (home, Easter Monday) in the next seven days. “It’s starting to click now,” Woodyard said. “Three clean sheets and three wins is testament to the hard work we’ve done and the togetherness we have in the squad. “We had a poor run before the current run and as players we had to take responsibility which we did. The coaches and manager had done all they could so it was up to us to sort it out and the response has been excellent. “It’s hard to play at Blackpool. It’s a long journey, the pitch is not the best and they are a good side who had a chance of the play-offs themselves. It was a case of who wants it more winning the battle. “And as a team we were very good. As always it was about keeping the ball out of our net because we have so much quality up top we are always likely to score. We have proper players up there. Dembele, Maddison, Tomlin and Toney are all quality. “But a big shout out to the defence though, They’ve been superb in the last two matches. The manager said afterwards that if we play with that sort of spirit and togetherness over the last five games we will be hard to beat and if we do get to the play-offs we are bound to be on a great run and in great form. “We don’t worry about what Doncaster are doing though. We are looking after our own results and hoping the teams around us slip up. Woodyard and Louis Reed have formed a decent midfield partnership during the recent Posh run and the captain is full of praise for his young teammate. “Louis is going to be a top player,” Woodyard added. “He’s still young and improving. He likes to sit back, get on the ball and dictate play which allows me more freedom to get around the pitch which is what I like to do.